Fourteen activist ministers and lay leaders apply a keen intersectional analysis to the environmental crisis, revealing ways that systems of oppression intersect with and contribute to ecological devastation. This highly anticipated anthology presents a powerful and penetrating look at environmental justice from some of the key thinkers and activists in Unitarian Universalism today. Fourteen activist ministers and lay leaders apply a keen intersectional analysis to the environmental crisis, revealing ways that capitalism, white supremacy, patriarchy, and other systems of oppression intersect with and contribute to ecological devastation. They also explore how spiritual practices, congregational organizing, and progressive theology can inform faith-based justice work in the twenty-first century. These prophetic voices, from a wide range of perspectives, reveal new approaches and opportunities for more holistic, accountable, and connected justice efforts. Each essay is accompanied by suggested ways to take the next steps for further learning and action. For the free online Common Read study guide and optional slides (PowerPoint) that will allow groups to project the discussion and reflection questions rather than write and display them on newsprint or a chalkboard, click here. Over the years, I have found that in order to continue the work I need to return to my source—love and commitment to life, no matter the result. My faith inspires and grounds my work for justice, and it cannot be separated from that work anymore than the pieces of my identity can be separated from one another. When I have tried to separate my justice work from my faith, I have burned out and caused harm to myself and others. 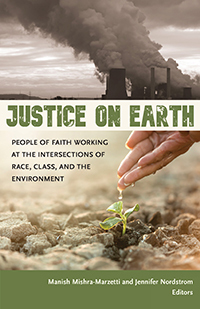 This book aims to provide resources to create and sustain a connection between your faith and environmental justice work. Without the call of interconnection, I would not have the motivation to do intersectional justice work. Without the experience of interconnection, I would not have the energy or stamina to continue it. Justice on Earth is energizing and illuminating—reading it filled me with motivation to work towards environmental justice in prophetic and deep ways, grounded in Unitarian Universalist faith community and values. I hope every Unitarian Universalist will read this book and take its messages to heart and into the world. The steepest hill to climb in the Unitarian Universalist Association’s Green Sanctuary Program is the required environmental and climate justice engagement. That is because many of us are still laboring under the problematic “traditions” of charity as primary or sole strategy (rather than partnership or following leadership from front line communities), and approaching justice issues as if they can be separated from one another. The Unitarian Universalist - sourced essays and stories in this book bring together pieces that have before now been spread through diverse disciplines. This collection has what I believe is needed for UUs who care about the environment and justice to deepen individual and collective understanding of the intersectional realities of environmental and climate justice. Through the lens of this book comes understanding that is difficult for many of us, but also beauty and joy that spring from alternatives discovered only together in relationship across boundaries.